Bonsai trees are often thought to have originated from Japan, but records over 2,000 years old show trees being grown in China, as part of landscapes planted in shallow containers. Around 1,500 years ago trees, many of which would have been collected from mountainous regions, were first grown as individual specimens and these can be seen clearly on ancient Chinese line drawings. Several centuries later the Japanese began growing and training trees in pots and have developed the hobby to its current level. Chinese and Japanese bonsai are very different in style, with Chinese style trees being more freeform and trained mainly by pruning, whilst Japanese trees are meticulously groomed and shaped, appearing more natural. A common misconception about the hobby is that it is 'cruel', with the trees being starved in order to dwarf them. Nothing could be further from the truth! Bonsai trees require regular watering, feeding and repotting to keep them in optimum health and in many cases they are actually healthier that their counterparts in the wild, enjoying the same longevity. Some trees in Japan have recorded histories spanning several centuries and are often traditionally passed from generation to generation, keeping them in the same family during their long lifetime. Root pruning is a widespread horticultural technique, used by many gardeners to produce better root systems on plants grown both in pots and in the garden, and is not just associated with bonsai training. This practice facilitates the growth of a well developed, compact root system with many fine, fibrous roots which are so necessary for taking up nutrients and does not restrict the overall growth. Various branch and shoot pruning techniques are what actually dwarf the tree, in the same way as trimming a hedge keeps it from growing into a line of large trees. The growing of bonsai, which translates literally as 'plant in a tray', is a truly satisfying hobby and combines both horticulture and art, creating trees that are often referred to as 'living sculptures'. Above all it is important that the trees are kept healthy and in excellent condition, as with any pot plant. Pruning and shaping does, however, require a certain amount of artistic imagination to visualise the future development of the trunk and branches. Bonsai should embody all that is so wonderful about trees that grow naturally in such a variety of shapes and sizes. Large specimen trees, ancient trees with hollow trunks, trees which have been shaped by severe weather conditions or even small forests can all be recreated in the confines of a pot. 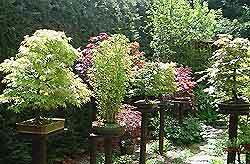 By growing trees in this way it is possible to have a mini-aboretum of delightful small trees in your own garden or even on a balcony, whatever the size. The timescale to create impressive bonsai is dependent upon the origin, species and general health of the tree. Trees grown from seed or cuttings will invariably take longer to create the images required than much older material, possibly collected from the wild or obtained as nursery stock, although it can be most rewarding to build a collection from a variety of different sources. However, actual age is not as important as the illusion of how old the tree appears - a well trained bonsai may look far older that it really is. Many species of trees and woody shrubs are suitable for training as bonsai, but if planted in the garden they would grow into full-size trees - there is no such thing as a special 'bonsai species'. Pruning and shaping is required to create and maintain the desired shape and size. Some trees are often used to achieve the appearance of different species, e.g. a juniper can look very effective when trained in the image of a pine. Trees that would naturally grow outdoors must not be cultivated indoors, where they will not flourish, but will soon die. Occasionally outdoor bonsai may be viewed in the house, provided that a cool area is selected and that the duration is no longer than a couple of days. Only tropical species of tree are suitable for growing indoors, figs, serrissas and pomegranates make particularly good subjects, although even these can benefit from spending the summer months outside. Bonsai can quickly become an important and very enjoyable part of your life. Don't be afraid to experiment with material, it is all part of the learning curve. 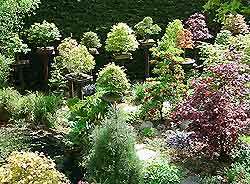 Spend time studying trees at exhibitions and in books, to determine what makes them good or bad bonsai specimens. Most trees do have faults of some kind and it is important to be able to identify these, but do look beyond individual features and learn to enjoy the actual bonsai tree as a whole unity! Patience is a definite virtue and the process of creating bonsai trees should not be hurried unnecessarily. Good bonsai can be trained in a relatively short space of time, provided that suitable material is selected at the beginning. Some of my trees have not always started out as ideal material, but by persevering, surprising and satisfying results have been achieved. This is illustrated with examples of many detailed histories of trees from my personal collection of bonsai, of which I have had the immense pleasure of growing for many years.